Dr Sam Kanyamibwa is the Founder and Executive Director of ARCOS since 2009. He is also the Secretary to the Board. Sam is a professionally qualified conservationist, with over 25 years of experience in conservation at international level and particularly in Africa. He is a teacher, ecologist, ornithologist and manager by training. 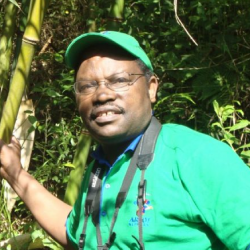 He led the development of research and monitoring at Nyungwe Mountain Forest with Wildlife Conservation Society in early 1990s. He then moved to Cambridge in the UK to head the Africa Programme at UNEP-World Conservation Monitoring Centre, before coming back to Africa in 2000 as Regional Representative of WWF for the Eastern Africa Region. He then became the Deputy Director for WWF-Africa and Madagascar Programe until 2007 and was the Regional Director for AWF during 2008/2009. Before taking up the full position with ARCOS, Sam was an international consultant and served several international organizations in areas of Integrated Conservation and Development, Organization Development, Program Strategic Development, Monitoring and Evaluation, Policy and Advocacy, Protected Areas Management, Training and Meeting Facilitation. As founder of a national NGO in 1992 (Association for Nature Conservation in Rwanda, ACNR) and a regional NGO (ARCOS in 1995), Sam has long experience with NGOs at local, national and international level. He has been involved in several policy processes at international level, as well as private sector in Eastern Africa. He was also the Chairman of the Pan-African Ornithological Congress in 1996 to 2000. Sam did his undergraduate studies in Biology at the National University of Rwanda, then went to France for his MSc in Evolutionary Ecology where he also completed his PhD in “Evolutionary Ecology and Natural Population Dynamics: case study of the White Stork Ciconia ciconia in relation to the wintering conditions in Africa”. In 2003, Sam obtained a Certificate in Advanced Management and MBA at Ashridge Management College, UK. Sam loves sport (former Rwandan National Basketball Team Player), Nature and people working together.